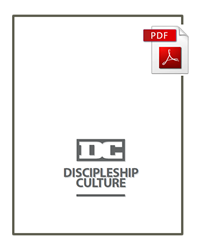 Discipleship Culture (DC) groups are small groups of 3-5 people and offer an opportunity for you to go deeper in your walk with Christ. DC was created to help people know and apply scripture, participate in life-sharpening accountability, and have a few people to walk with through the ups and downs of life. We believe if each person really puts their best into Discipleship Culture, they will see exponential spiritual growth in their life and in the lives of others. If you are interested, check out the curriculum below and email Kelsey Williams at kelsey@centrechurch.org.